UK MTB scene stalwarts Orange Mountain Bikes can trace their ancestry back to wind surfing company Tushingham. Orange’s Lester Noble worked for Tushingham back in the 80s and there the Tushingham mountain bike range was designed. 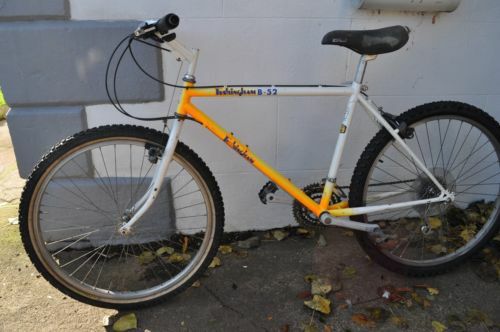 The lucky owner of this Tushingham B-52 which is being offered for sale on ebay picked it up without realising the bike’s significance and is now selling it. The B-52s apparently came from the same factory as the Muddy Fox Courier, hence numerous similarities. Tushinghams are a rare beast, later in the 80s Lester Noble went on to form Orange with Steve Wade and the rest is very much history! The word legend is one which is used all to readily, especially in sporting endeavour. For a select few the titled is deserved, the sadly late Jason McRoy was surely one of those. In the days when MTBing was still a relatively young sport and many retrobikers still young men JMC took on the best in the world and in many cases won. His life was tragically cut short but the memory lives on. The McRoy family have been auctioning some of his bikes with proceeds going to charity. This FSR was the last bike Jason raced on and was sold earlier this year for a shade over £5K. The seller has relisted it, once again some proceeds are going to the JMC Foundation. Check the auction out here > JMC Specialized FSR and discuss in the forum here. Back in 1995 the iconic UK MTB video Dirt was filmed in and around the grounds of Pete Tomkins’ house in Yorkshire. Tragically one of the stars would never see the finished cut – UK MTB legend Jason McRoy’s life was cut short in August 1995. 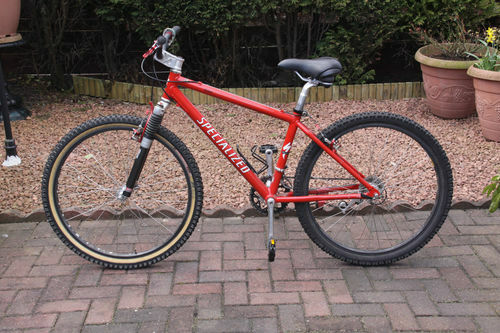 The McRoy family have owned the bike Jason rode since then but have now decided to place it up for sale, click here to see JMC’s Specialized S-Works from Dirt auction on ebay and click here to discuss in the forum. The bike has been cherished ever since and is specced as it was for the video – with the exception of the pedals and saddle. The small S-Works frame features carbon specialized suspension forks up front, partial XT groupset, Avid brakeset, DT hugi hubs, Azonic risers and of course a red Dave’s Chain Device aka the DCD. 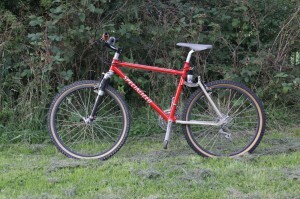 This S-Works was also raced by JMC on the dual slalom circuit that year. This is a unique chance to own a genuine piece of UK MTB history. Read on for more images of the bike.. Here is your chance to get hold of one of the late great Jason McRoy’s jerseys, this is the one he wore at the ’92 Worlds in Bromont. 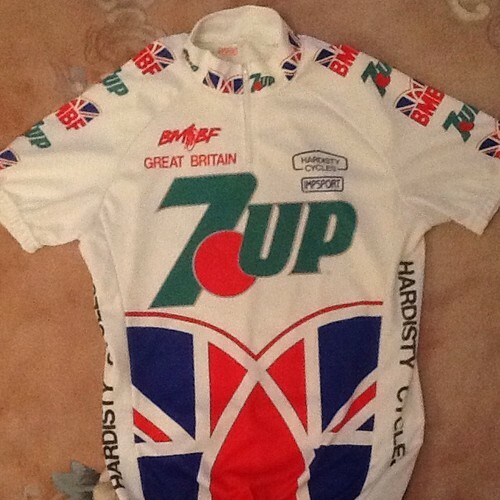 The Jason McRoy jersey is currently on eBay, all proceeds go to Children in Need, click here to view the auction (and bid) or click here to discuss on the forum. 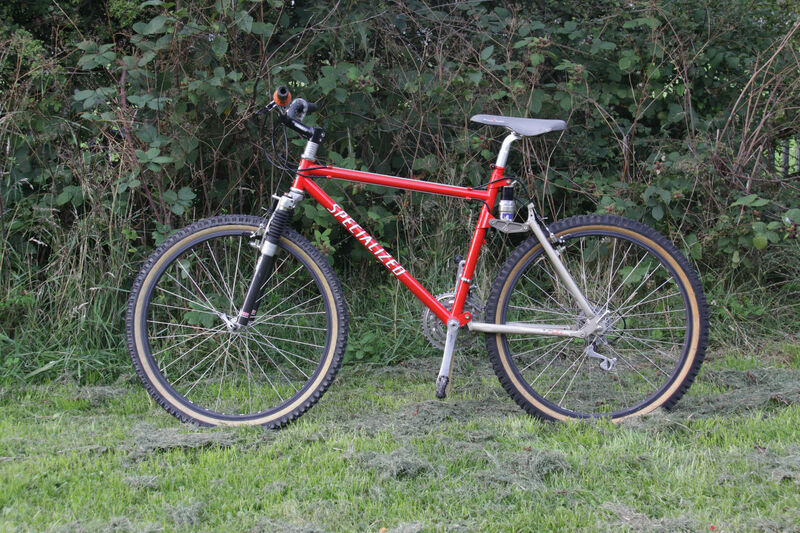 Fancy an upgrade of that old Kona? An unknown seller with a bike of unknown provenance has something you might like. It’s Charlie Cunningham’s Indian #1. Frank Wadleton aka Frank The Welder of Yeti (and lots more bedise) fame is selling his Yeti Ultimate on the ‘Bay, click here to see Frank’s Yeti Ultimate. The auction is to help his friends out who have had a bad run so we hope it goes very big.